Meet our first-ever Fertile Ground Fund grantees! In 2018, we launched our Fertile Ground Fund (FGF), supporting 43 organizations in the United States and around the world, with grants totaling $212,000. Join us in celebrating the work of all our incredible grantee partners, and read more about their work. It is with great excitement that we announce our first Fertile Ground Fund grantee partners! Our first Fertile Ground Fund (FGF) cycle supported 43 organizations in the United States and around the world with grants totaling $212,000. The Fertile Ground Fund is a flexible funding source that provides resources based on the shifting needs and desires of Astraea’s grantee partners, giving them the ability to be more nimble and responsive. 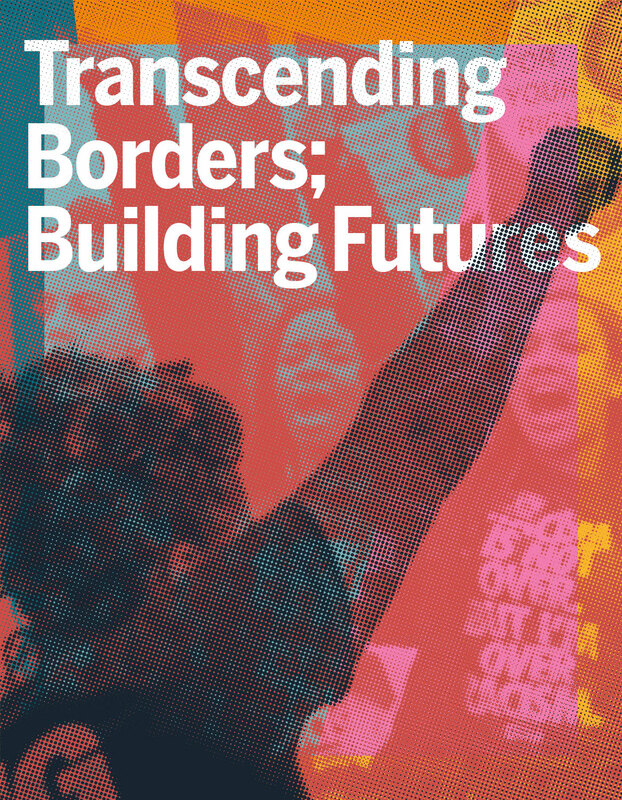 It supports activists to seize opportunities to seed and grow movement visions, ensuring organizations can prioritize collective liberation & sustainability towards building long-term movements. Closing civil society spaces, increased violence against organizers & human rights defenders, heightened discrimination, and police violence against LGBTQI, Black, Brown, Indigenous, migrant, and other communities across the world make this an extremely challenging political time for grassroots activists. This first round of grants were an opportunity for us to resource and bolster groups’ capacity to respond to and strategize ways to resist oppressive state policies and practices quickly, strategically, and effectively. The grants awarded in this first cycle support resistance strategies from projects intervening on the violence of policing to deepening cross-movement collaborations, ultimately generating local, national, regional, and global opportunities that strengthen organizational and movement capacities. Designing forums exclusively to strengthen LBQ women and movements around the world: The first Global Feminist LBQ Women’s* Conference is being organized in South Africa in July 2019 by a collective working group of 22 LBQ women* activists from across all regions of the world. It aims to create a space for activists and advocates to come together, share knowledge, exchange strategies, strengthen connections, mobilize resources, and take the lead in building a global LBQ women*s movement with the capacity to influence the world agenda on human rights, health, development. Creating spaces for activists to strategize around the lived experiences of LGBTQI people, as well as around resource development and mobilization of movements: Tajassod-Qorras, a Lebanese queer trans embodiment initiative, will be collaborating with Coalition for Sexual and Bodily Rights in Muslim Societies (CSBR) to organize the ‘Tajassodat: Conversations to Advance Trans Rights and Justice across Muslim Societies’ convening in Nepal in May 2019, which hopes to increase resources and raise awareness around nascent trans rights and justice movements in the Middle East, North Africa (MENA) and South Asia & Southeast Asia (SSEA). The convening will break silos for trans Muslim activists often working in isolation, help them build formal relationships, and advance collaboration with other activists, as well as deepen critical analysis of successful approaches to advance trans justice in Muslim societies. Combatting state criminalization efforts and fighting back against racist, homophobic, transphobic, nativist, and capitalist aggression from state forces: The Alliance to Mobilize Our Resistance/La Alianza para Mobilizar Nuestra Resistencia (AMOR) is a rapid response network created by a coalition of People of Color-led organizations. The Providence Youth Student Movement (PrYSM), in Rhode Island (USA), supported the founding of AMOR to respond to instances of “state hate” stemming from law enforcement and immigration. They are collaborating across Black, South Asian, Southeast Asian, undocumented, Indigenous, and refugee organizing to build up this alliance, which will provide communities with emergency legal services, culturally competent psychological services, and support for victims violence and for tracking incidents of hate crimes. Please join us in celebrating the work of all our incredible grantee partners, and read more about their work in the links below. *Note: We do not publicize a number of our courageous grantee partners because of security threats they face in their local contexts, so organizations may be missing from this list. By supporting Astraea, you are creating ecosystems of resistance that are smart, effective, and unique. Join us! 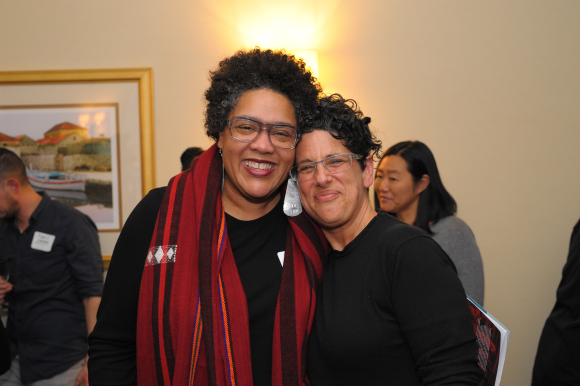 Join us as we review 2018 with highlights from Astraea and our bold, brilliant grantee partners from around the world. In 2018, we made 256 grants totaling $4.6 million to organizations in 69 countries and 21 U.S. states. We accompanied our movements beyond funding; in addition to making grants, we strategically invested in cross-border LBTQI movement building, we lifted up grassroots organizing by prioritizing the holistic security of activist communities, and we connected beyond oppressive structures to harness the power of ancient and new technologies, providing solidarity in critical times. Join us as we review 2018 with highlights from Astraea and our bold, brilliant grantee partners from around the world. Read about how together, we are creating the future we believe is possible and necessary for our communities to thrive. This Trans Day of Visibility, Astraea celebrates the power and vitality of Trans Movements worldwide by uplifting some recent grantee partner achievements in trans organizing. This Trans Day of Visibility, Astraea celebrates the power and vitality of Trans Movements worldwide by uplifting some recent grantee partner achievements in trans organizing. We are committed to building vibrant and sustainable trans movements globally. This year, we awarded over $1.6M to groups led by trans & gender non-conforming people. California, U.S.: TGIJP advocated for legislation which passed, allowing incarcerated trans people to change their name and gender marker. 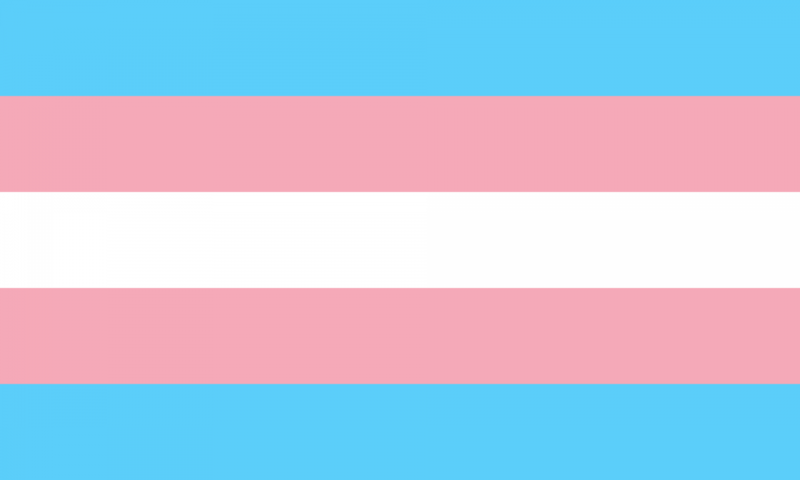 Nigeria: THRIN held a large symposium for the trans community and allies. 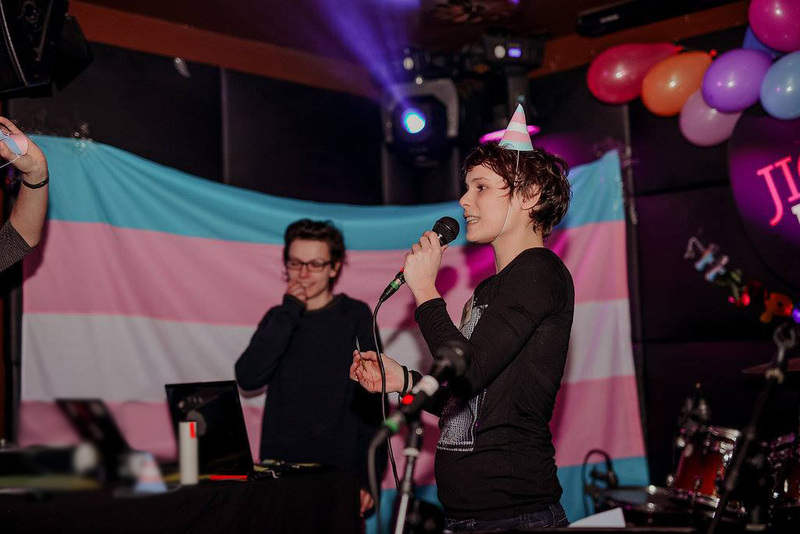 Croatia: Trans Aid held the first national TRANSummer Camp. South Africa: Gender DynamiX redrafted a gender recognition law to incorporate rights for diverse trans people. India: Trans activists and allied groups protested and successfully delayed passage of the regressive Trans Rights Bill. Honduras: CATTRACHAS submitted an argument to the Inter-American Commission for Human Rights for failing to prevent, investigate, and prosecute the execution of a young transgender woman, Vicky Hernández. Malaysia: Justice for Sisters advocated against the Court of Appeal for retracting a decision that affirmed the right of a trans man to change his name and gender marker. Botswana: Rainbow Identity Association created support groups for trans and intersex individuals in regional cities across Botswana. Dominican Republic: TRANSSA opened one of the first community education programs for trans people in the country. Serbia: Gayten-LGBT and Labris Belgrade disputed a law requiring trans people to have “reassignment” surgery in order to change their gender identity on official documents. Chile: OTD advocated for a bill which passed, allowing people over the age of 14 to change their name and gender in official records. New Orleans, U.S.: BreakOUT! proposed a bill on gender inclusive bathrooms which was passed by the mayor. Ukraine: abolished arbitrary and cruel trans health protocol thanks to Insight’s advocacy (2017), but Trans rights activists were attacked with pepper spray during Ukraine march (2018). Kyrgyzstan: Labrys Kyrgyzstan developed a guideline based on WPATH which includes human rights component and guidelines for legal gender recognition, which were signed by the Ministry of Health. Thanks to all our grantee partners and activists fighting for trans rights across the globe! Support organizations like these all over the world who are on the front lines of international trans rights movements. Join Astraea on March 13, 2019 as we celebrate the brave and creative activism around the Commission on the Status of Women (CSW). 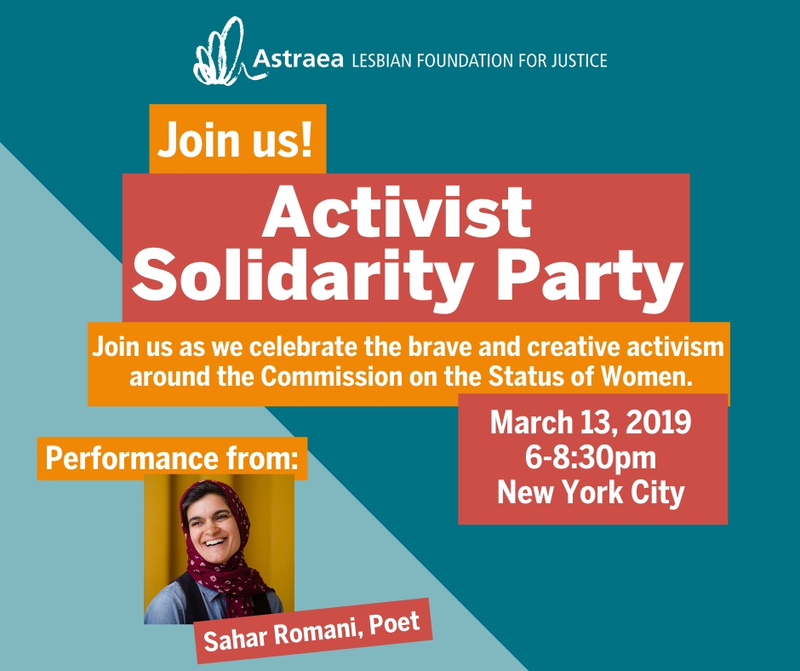 Join Astraea Lesbian Foundation to celebrate the brave and creative activism that shapes our world around the Commission on the Status of Women (CSW). 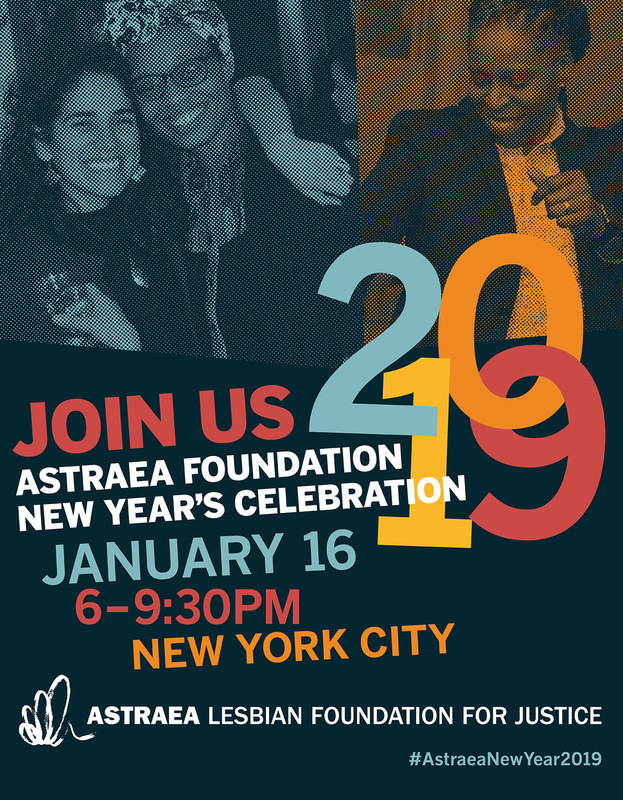 Come to the Astraea office to meet and connect with Astraea grantee partners, allies, and communities. Enjoy hors d’oeuvres, live performances, and dancing! Celebrate CSW week with Astraea. 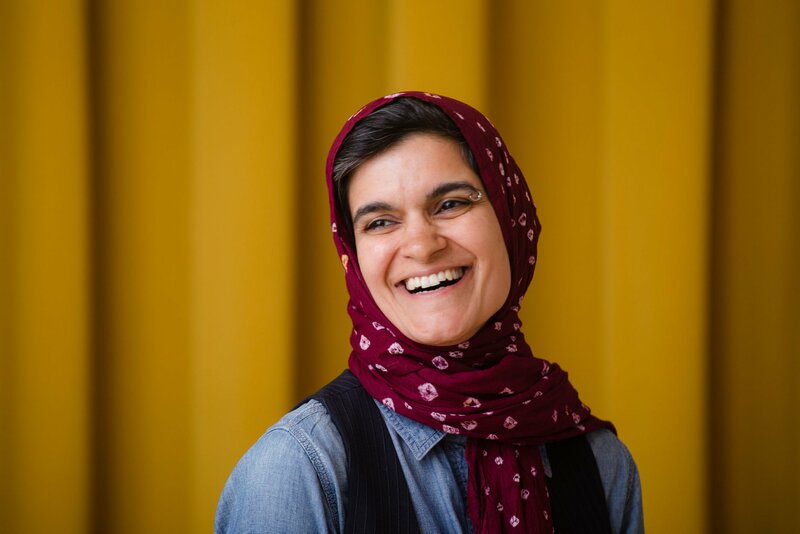 Sahar Romani is a poet and educator. Her work appears in The Offing, Asian American Writers’ Workshop’s Margins, Entropy and elsewhere. She is a recipient of fellowships from Poets House and New York University. Sahar grew up in the Pacific Northwest and currently lives with her partner and cat in Queens, New York. 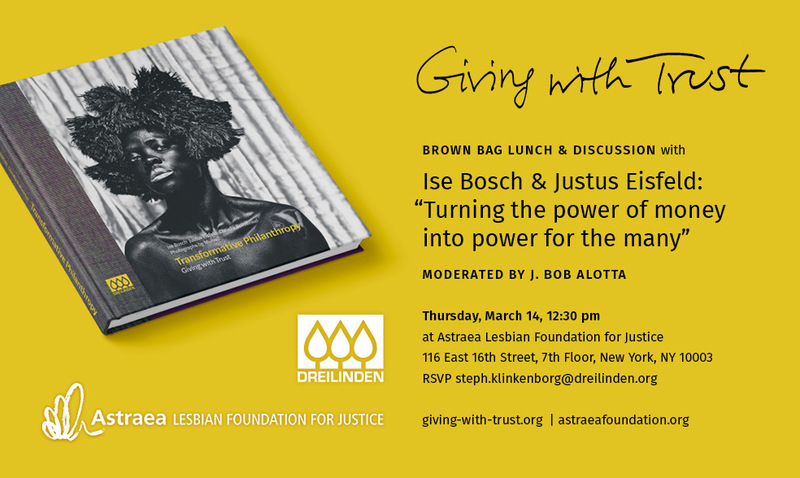 Join us in New York City as Ise Bosch and Justus Eisfeld discuss their new book, Giving with Trust, and how the power of money can be transformed into power for the many. Join us in New York City as Ise Bosch and Justus Eisfeld discuss their new book, Giving with Trust, and how the power of money can be transformed into power for the many. Titled “Turning the power of money into power for the many,” the lecture will deal with questions like: How can we create mutual trust and stand together to shape more humane societies? How can we give in a way that transforms both the recipient and the donor? Do we dare to try something new? Ise Bosch and Justus Eisfeld will talk about the themes explored in Transformative Philanthropy – Giving with Trust, a book in which both, together with co-author Claudia Bollwinkel, reflect on holistic grant making, philanthropic involvement, and impact investments by Dreilinden gGmbH. For more than ten years, Dreilinden has been championing the rights of lesbian, gay, bisexual, trans, intersex, and queer people and strengthening social movements around the world. The book therefore features the voices of partners, grantees, and constituents of the projects backed by Dreilinden. It also discusses privilege, power, trust, and access, and offers a new view on philanthropy and its possibilities for impact. This Valentine’s Day, we’re loving our people! In recent months, we’ve been thrilled to welcome four new staff members. This Valentine’s Day, we’re appreciating the staff members who work daily to advance Astraea’s mission to resource frontline LGBTQI activists in the U.S. and around the world. In recent months, we’ve been thrilled to welcome three new staff members. 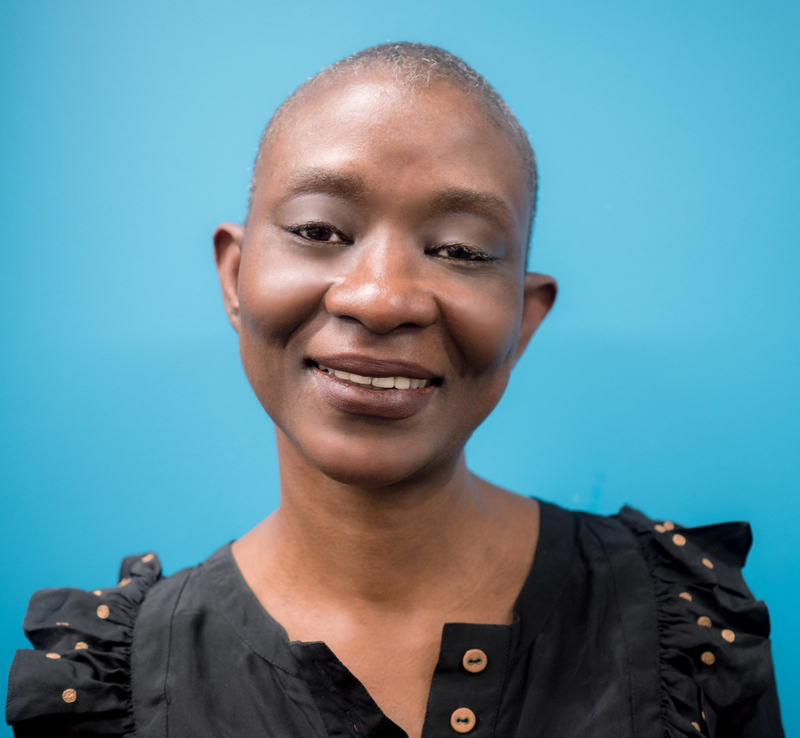 We’re delighted to welcome Loé Petit to the Intersex Human Rights Fund as a Program Associate, where they’ll work closely with our IHRF Program Officer, the Intersex Fund Advisory Board, and intersex leaders in regions around the world to further resource and garner support for multi-racial, intersectional and global intersex movement-building. Biola Odunewu brings her strong organizational skill, good humor and Nigerian herbal tea apothecary prowess to our team as Executive Assistant. Lastly, Hanna Israel’s West Coast savvy and diligence bolsters our fundraising efforts as Development Associate for Institutional Giving. Our staff, both new and old, continue to drive and shape Astraea’s work as we resist and build collective power and liberation among LGBTQI movements. We’re grateful for all they do! Astraea seeks an experienced fundraising professional to lead Astraea’s Individual Giving Strategy. The DD will work closely with the Executive Director to create an environment for success that inspires staff and provides holistic, adaptive systems to support the organization’s mission and values. In September 2018, Mozilla announced its latest cohort of 25 technologists from 10 countries that would partner with organizations including Astraea to address emerging threats and challenges that prevent the internet from remaining a force for good. 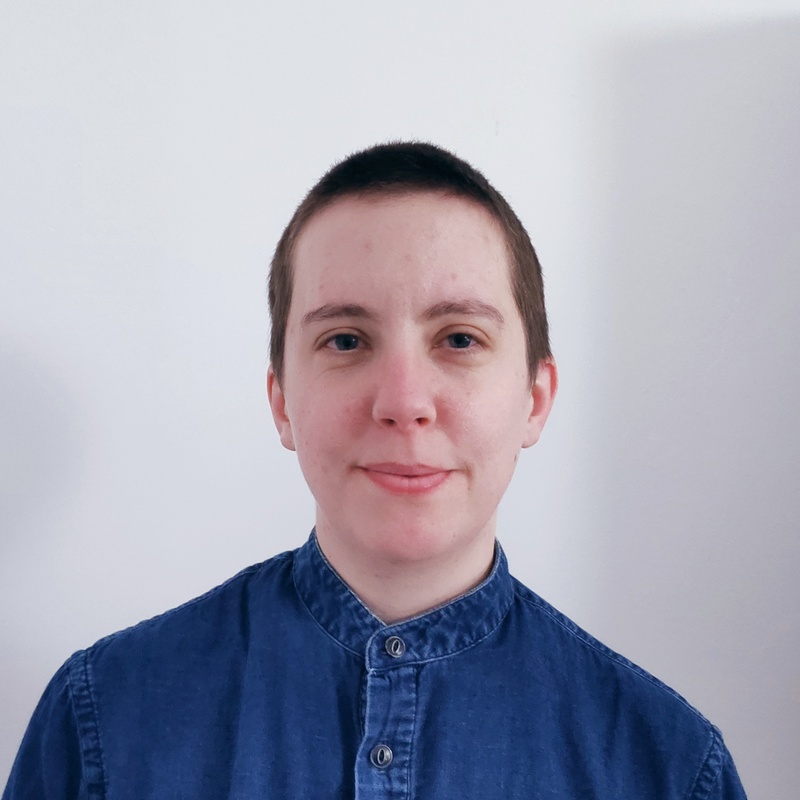 On Feb 27th, Astraea’s Mozilla fellow, Maya Richman, will share a bit about her work here at Astraea, and the value of embedding technologists within under-resourced organisations. Astraea is celebrating the one year anniversary of our ‘Why We Fund’ series with a conversation centering on holistic security for organizations and collectives. 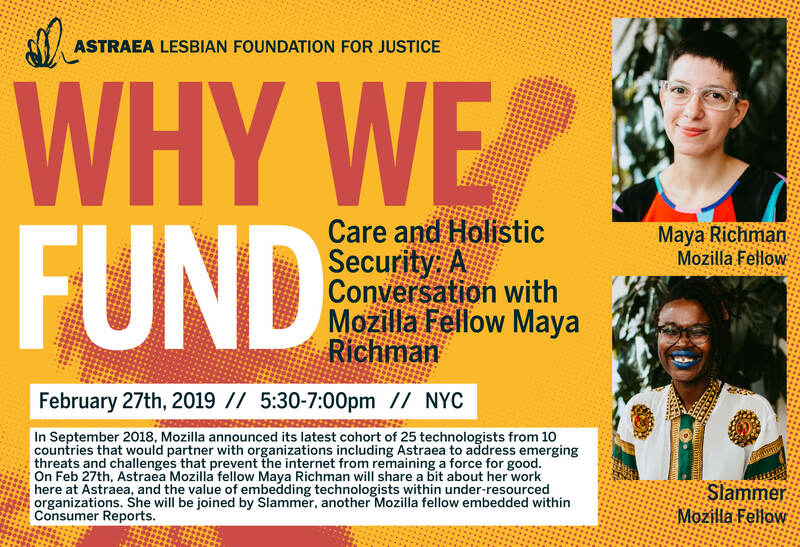 We are quite thrilled to have our Mozilla Fellow, Maya Richman, in NYC to share a bit about her work with Astraea, the Mozilla fellowship, and how holistic security intersects with our healing justice work. 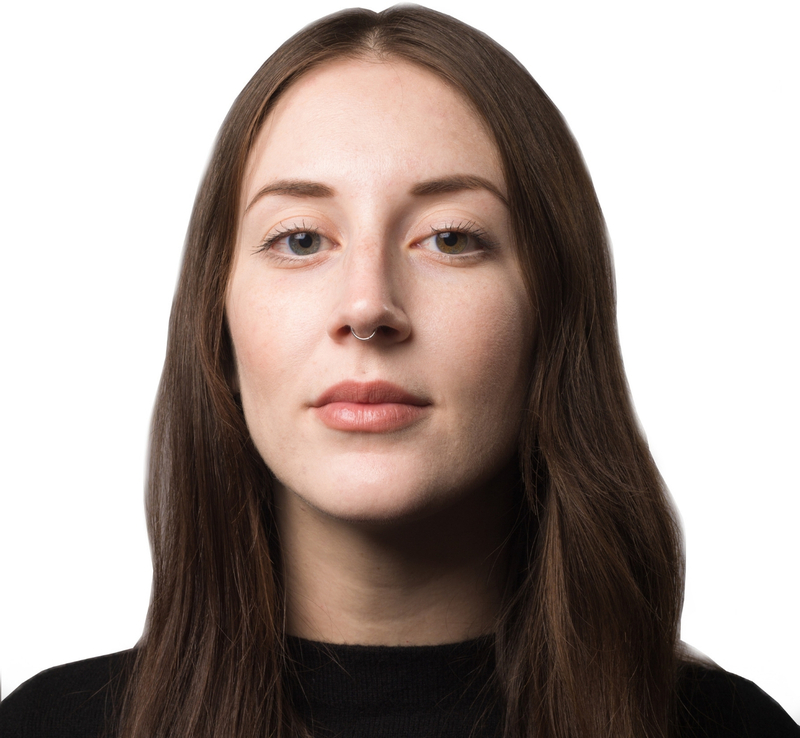 Maya will be joined by Slammer, another Mozilla Fellow embedded within Consumer Reports, who will share her experience as a security practitioner and fellow. We hope you can join us. The consistent goal through our Why We Fund series is for Astraea to provide space for engagement around issues, and build a greater understanding of why, where and how Astraea funds this work, and in the specific ways that Astraea always has. We will have wine and light refreshments, and it will be an opportunity to be in community, as well as in conversation. Astraea condemns the Supreme Court’s recent decision to stay injunctions in recent trans military ban cases, effectively banning trans people from serving in the military. Astraea condemns the U.S. Supreme Court’s decision to stay injunctions in recent trans military ban cases, effectively banning trans people from serving in the military. We deplore this stance, as its function is to dehumanize trans people and deny them a key avenue of access to resources like healthcare and education. Like many other tactics deployed by the current administration, we see this action for what it is–an effort to pretend to “protect” an invisible electorate from an imaginary enemy. At the same time, Astraea strives for the demilitarization of the state and dismantling of mechanisms that force people to participate in the military industrial complex in order to access vital resources. We hold these contradictions because it is our responsibility to, and we vow to continue supporting work that does not shy away from paradoxes or nuances, but that seeks solutions that free us from all forms of oppression.